The Tigers West are the 2018 Rookie-level Gulf Coast League champions. 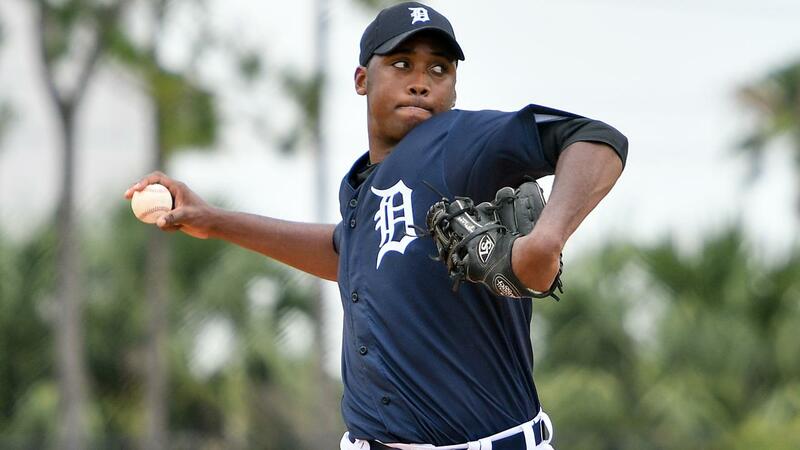 The GCL Tigers West were pushed to a decisive Game 3 in the championship series, and unlike the first two games where the squad received a solid performance from either the pitching or the offense, both facets shined on Wednesday as they cruised past the GCL Cardinals, 9-2, at Roger Dean Chevrolet Stadium. "This is unbelievable," said first-year GCL Tigers West skipper Brayan Pena. "There just aren't words to describe how much I appreciate our coaches, the front office, the organization and especially the players. They deserve all the credit. They went out there every day and they bought what we were selling and that was: commitment, toughness, hard work and respect for the game. And it just paid off. "Everyone here put me in a great position to be successful. I had a great relationship with all the coaches, the trainer and they were here day in and day out working hard with the kids to make sure they were prepared and healthy, and that gave us a chance. This is a collective effort, and we are blessed that we all work together. Thanks to our front office people for assembling this group and giving us the opportunity and trusting us. We had a lot of fun." Tigers West starter Chavez Fernander set the tone after allowing a run on four hits and a pair of walks with nine punchouts over 5 1/3 frames. The 21-year-old righty retired the side in order in the first before working into and out of trouble in the next inning. The Cardinals loaded the bases with nobody out in the second, but Fernander limited the damage to one run after inducing fielder's choice groundouts by Mateo Gil and Carlos Soler before catcher Eliezer Alfonzo caught Soler trying to steal second. "He came through for us like he always did," Pena said. "He was huge against Boston and through the season whenever we needed him. He's one of those guys that will do whatever you ask and he's going to give you everything he's got every time. We're lucky to have a guy like that, and I could not be more proud of him." This year's 35th-round Draft pick struck out the side in the third and retired eight of the next 10 batters he faced. After yielding a leadoff double in the sixth to Jhon Torres, Fernander got Ivan Herrera to ground out. He was promptly removed for Jake Baker. Baker and right-hander Maddux Conger combined for 2 2/3 shutout innings, allowing a hit and two walks while fanning four. Michael Gizzi pitched the ninth and yielded a run without surrendering a hit. After hitting Zack Gahagan, the 23-year-old walked Tyler Fuller and Gil before Soler lifted a sacrifice-fly into deep left. Tigers West shortstop Ildemaro Escalona was a catalyst for the offense. The 19-year-old laced a two-out, two-run double to left to cap a three-run opening frame and later cleared the bases with a three-run triple the other way to right as part of a five-run third. Escalona came around to score two batters later on an RBI double from Justin Childers. "He just went out there and competed," Pena said of Escalona. "He gave us great at-bats all day and I saw fire in his eyes from the first inning. He actually came over to me and said, 'I got you.' He's been a rock all season for us and I know how much he wanted this." After taking Game 1 of the best-of-3 series, 1-0, in wild fashion, the Tigers West suffered an 11-5 loss to the Cards in Game 2. The second game of the series was suspended because of rain on Tuesday -- after the Cards posted an eight-run fifth -- and resumed Wednesday at 10am. It was completed with the teams combining for 24 hits. "We had a meeting when we got here in the morning. We said today we start 0-0. Whatever happened yesterday doesn't matter," Pena said. "So we scored some runs to finish the first game and then we carried that momentum into Game 3. We knew we had a chance to do something special today so we stayed aggressive to start Game 3 and set the tone right away."